We are now in the time of year in which we often experience heavy storms. But, how do you prepare for such an event, and what do you do to recover once it happens? The Red Cross has several safety tips to help you and your loved ones deal with any oncoming tornado or other storm. Their tips also include information about how to proceed once it is over. One of the biggest issues to be aware of is the difference between a “watch” and a “warning”. Simply put, a watch means that a storm is possible, whereas a warning means it was sighted and definitely coming to this area. Take note of which one your local weather report has given. Make sure you have everything you need to prepare for a tornado. 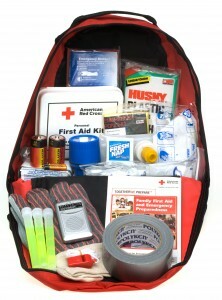 These kits are available from the Red Cross and the contents can be customized. In order to prepare for such an event, there are several things you can do. First, listen or watch for updates to the weather report. Things might change in the coming hours. You may also get updates on social media. Many stations now have Facebook, Twitter and other pages to keep you updated on a moment’s notice. Pick a safe room in the house away from windows – preferably on the lowest level of the house. That room will usually receive the least amount of damage. Pick up any dead plants and clean up dead trees around the house. High winds will often blow these items around the house, and could damage the property or any person still outside. Stay on the lowest level of the house. As stated before, it is the area that will receive the least amount of damage during a storm. If you live in a mobile home, stay with a friend or family member. Simply put, mobile homes are mobile. Therefore, high winds may blow them around because they are not secured by a foundation, in the same way that a house is secured. Continue listening and watching weather reports. The worst may not be over. Stay inside until you hear or see the “all clear” signal. If you smell gas, open a window and get out! Call your gas company or fire department. The smell could indicate a gas leak. Beware of loose wires around the house. They may not be grounded and could be live wires. Use a battery-powered flashlight if the power is out. DO NOT use a candle. The fire and smoke could cause a problem – especially if there is a leak somewhere. Check for spilled items or damage around the house. Quite often, a storm will cause things to fall. Make sure to clean up anything that has fallen. The Powell Group wants you to stay safe. Please take precautions during any upcoming storm and make sure you stay safe during and after the event. Our team is here to answer any questions you may have.